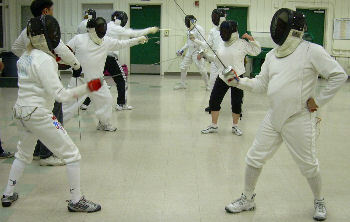 There's always something new to learn about fencing! Luckily, many knowledgable fencers, historians and humorists are eager to share their insights into our sport. We've listed some of our favorite resources here. Maestro John's classic precis — written and drawn in his own hand — has been successfully introducing new fencers to the basic moves for over forty years! Coach Greg, the assistant instructors, and other advanced fencers have developed additional useful handouts to accompany John's core document. Victory Fencing Gear is run by Cole Harkness, a former student of Maestro John and a friend of the Salle; Cole offers top-quality goods, excellent advice, and friendly service. American Fencers Supply also carries top-notch products. Alliance Fencing Equipment used to be called Athos. And if you'd like to show off your Salle DeCesare spirit, check out our Cafe Press shop for T-shirts, mousepads, mugs and more!